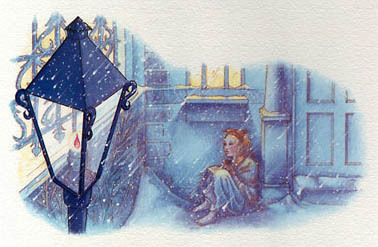 In the cold and the darkness, a poor little girl, with bare head and naked feet, roamed through the streets. It is true she had on a pair of slippers when she left home, but they were not of much use. They were very large, so large, indeed, that they had belonged to her mother, and the poor little creature had lost them in running across the street to avoid two carriages that were rolling along at a terrible rate. One of the slippers she could not find, and a boy seized upon the other and ran away with it, saying that he could use it as a cradle, when he had children of his own. So the little girl went on with her little naked feet, which were quite red and blue with the cold. In an old apron she carried a number of matches, and had a bundle of them in her hands. No one had bought anything of her the whole day, nor had anyone given her even a penny. Shivering with cold and hunger, she crept along; poor little child, she looked the picture of misery. The snowflakes fell on her long, fair hair, which hung in curls on her shoulders, but she regarded them not.